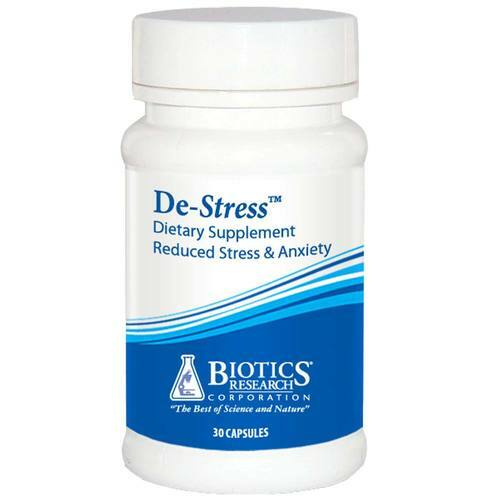 Biotics Research Corp De-Stress provides 150 mg of hydrolysate in the form of hydrolyzed casin concentrate. Warnings: Contains ingredients derived from milk. Keep out of reach of children. Store in a cool, dry area. Sealed with an imprinted safety seal for your protection. Do not take more than suggested dosage. Consult healthcare provider before starting this or any other dietary supplement. Recommended Use: One (1) capsule each day as a dietary supplement or as otherwise directed by a healthcare professional. De-Stress can be taken during the day at time of intense stress, or before bedtime.